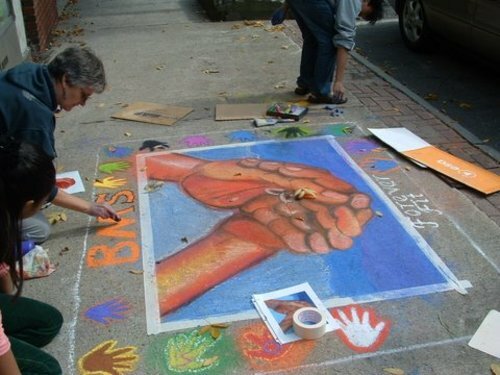 The Heart of Biddeford (HoB) holds its annual 'Chalk on the Walk' street painting festival on the last Saturday of September. 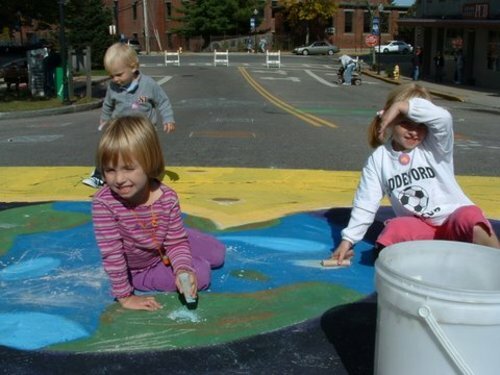 Here is an opportunity for street painting artists of all kinds to come together and create beautiful street painting throughout the Biddeford downtown. There will be live music,food, a craft fair, and other special events that you can see during the festival. If you are an artist doing a street painting there, feel free to send us pictures or video of you at work for streetpainting.tv viewers to view and enjoy! Let’s talk about the 2008 Festival, what are the highlights that everyone should be aware of this year (featured artists, new musical/entertainment/vendors, etc.)? This year’s theme is "Heroes", which will give people a broad range of opportunities of subject matter to draw for the Chalk on the Walk. Each year we create a children’s mural which is about 50' x 30' feet. 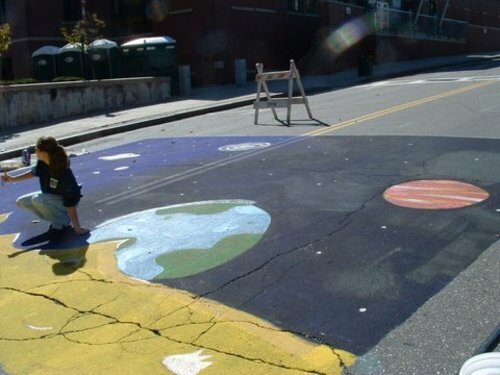 This mural is tempera paint on the street on which children can add chalk drawings and figures. In keeping with the Heroes theme we have added interactive activities, through the police and fire departments, which will be both educational and fun. The police will bring a bike rodeo downtown and the Fire Department will bring a smoke house, there may be a rock wall as well. 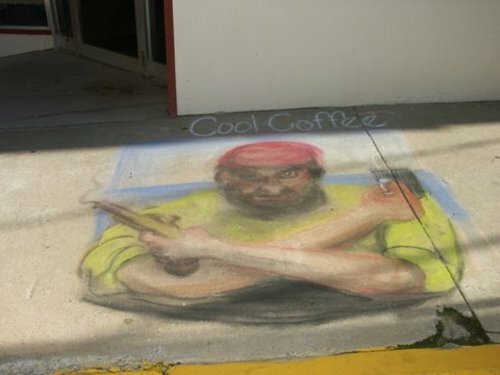 This year there is a lot more street chalk available in different hues and mediums, we look forward to adding to the diversity of each chalk drawing by using different types of chalk. One thing we look forward to each year is the individual art works, they seem to get better and better each year as the competition grows. This year’s theme is Heroes. We want people to think about whom their heroes are and what makes a hero. 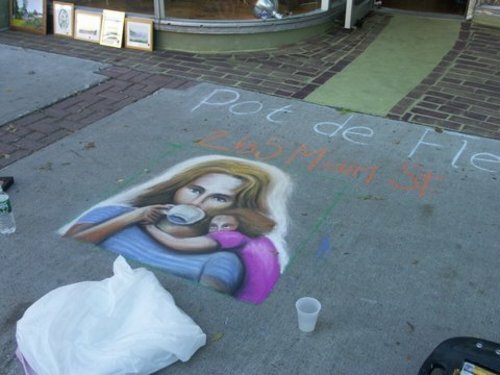 We think this is an interesting concept to see children and adults draw out on the streets and hope to see tons of different interpretations on the hero theme. We expect to see police and firemen, superheroes, parents and grandparents and complete surprises. 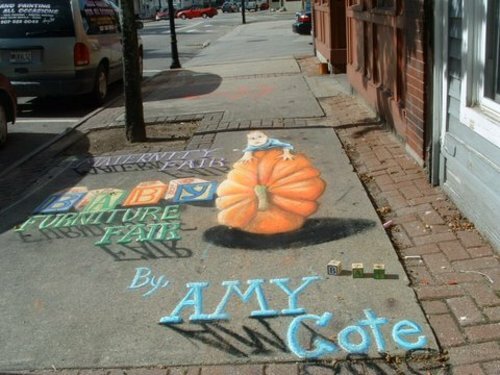 Do you get artists interested in doing the 3-D or anamorphic chalk art styles? 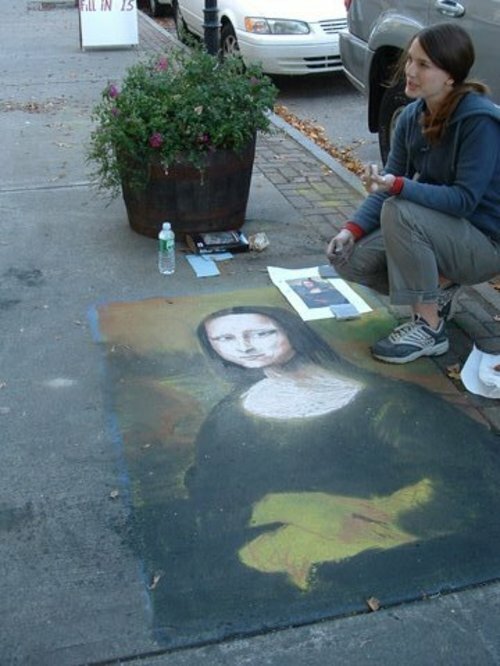 More and more artists are beginning to experiment with 3-d chalk art. We are looking forward to trying the new 3-d chalk products on the market (in addition to the Prang products that we use) this year and seeing what artists can do with those. We work with local art teachers from K-12. Some of the younger art classes work on group pieces and use a grid to transfer a smaller painting to the large scale of the sidewalk. Other, older students, create their own original work. 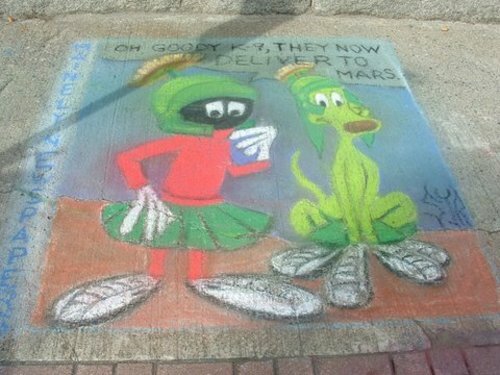 The gifted and talented art classes have used the Chalk on the Walk specifically for class projects in the past and have held critiques on the sidewalk. Are there special artists coming to work from the region that we should know about? Not that we know of, but we would love some help getting high profile artists to come. 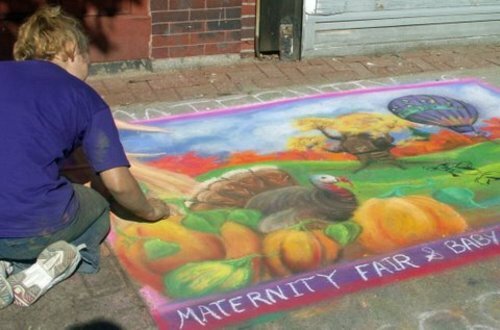 There is some exceptional local talent that always impresses the crowds each year. For children we create a 30' x 50' themed mural, which they can add to. 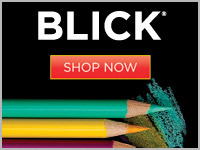 This helps kids who can't quite imagine their own composition but want to add to a collaborative piece of art. We also chalk out small squares for kids to fill in around the mural. 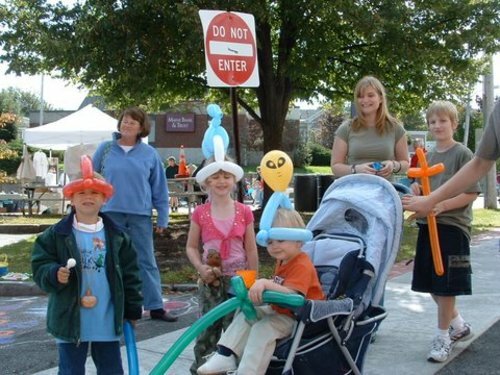 All of the kids’ options are free. We offer prizes in children’s age groups as well as prizes for adults’ works. This is by far the biggest family festival downtown. Last year over 1000 people came and really enjoyed themselves. Our goals are twofold; first and foremost we want to get people downtown, walking around enjoying the community. Secondly, we want to offer something for everyone, which is why we have music, kids’ activities, food, art and other entertainment. What's nice about our festival is that it's confined to our downtown, the backdrop being our old brick mills and buildings. Our downtown is experiencing revitalization currently and is becoming more of an art and cultural community and people get really excited about this festival. It feels good for everyone to be coming back downtown and doing something so colorful and festive. 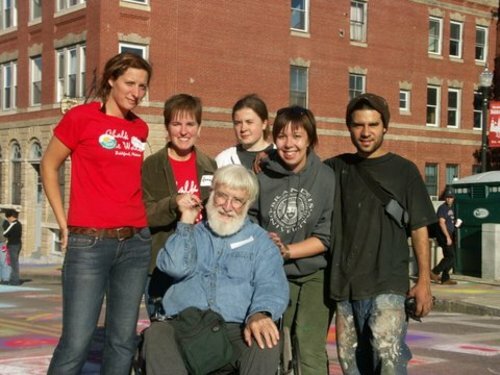 In the center of this picture is Robert Guillemin aka 'Sidewalk Sam' taking a moment for a picture with fellow street painters at Chalk on the Walk.